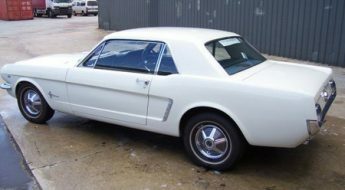 I’ve previously posted about the early Mustang prototype and now here’s some information on another early Mustang prototype that was put together by legendary Italian car designer Giugiaro Bertone. Bertone is credited with designing some of the best-selling cars in the world from Ferrari’s to Alfa Romeo’s and BMW’s so this Mustang baffles me a bit about how it fits into the picture. In 1965 Bertone produced the car for Automobile Quarterly founder L. Scott Bailey. 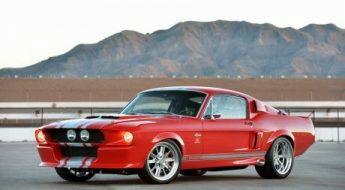 The Original Mustang was an immediate success in the US. However in Europe they were a lot less enthusiastic about the ponycar. Mr Bailey noticed this and he thought that a more European design might be more appealing. This is where Bertone came in. After visiting the Paris Motor show Bailey was considerably impress with Bertone’s Canguro (based on an Alfa Giulia Tubolare) and subsequently Bertone was invited to leave his mark on the Mustang. To begin with Bertone received a “naked” Mustang. The wheelbase was left the same however the radiator and steering column were installed at lot lower and the retractable headlights were installed to meet the American guidelines. The car oozes some of Bertone’s styling cues: retractable headlights and side and front grilles. The hood shows 3 “bumps”, 2 for the shock absorber connection points and 1 for the air filter. The whole front of the car is also lowered about 115mm. The peculiar little side windows can be opened electrically, and the backside of these serve as a rollbar. Even with this strength the roof is still very light-looking, another Bertone touch. Mr Bailey (and Ford) were very happy with the result, so happy that the Bertone Mustang got a place of honour at the New York Motor Show. Currently the whereabouts and the condition of the car are unknown. Hope fully it survived somewhere. Rumours suggest it was stolen from a Monte Carlo dealership and others state it was sold to a Greek Shipping captain. But no one can confirm this. Here’s some pictures of the 1965 model and also the more recent 2005 Concept. That’s kind of crazy no one knows where it is, would be a sweet car for someone’s collection. When I think of it, maybe Jay Leno has it? lol You never know, I bet some collector owns it. is this mustang selling ? if so where do i find it and what is the price range ? By far the most beautiful Mustang I’ve ever seen. Recently I found out that the Japanse small series 1:43 scale model manufacturer YOW MODELLINI has made a scale model of this beuatiful design done by Giugiaro during his period he was working for Bertone. The scale model is just as stunning as the actual vehicle, should you have an interest you can it find it on their website.